We had great river conditions last week, cool water and air temperatures, combined with some anglers that know how to get after the Chinook! Add a fairly large number of Chinook moving through the system and we had a very successful week of fishing. Anglers harvested an estimated 201 adult Chinook in the two river sections from Challis to Sawtooth hatchery. This brings our season total up to 207 adult Chinook harvested (see table below from Jon Hansen and Brent Beller), which means we are approaching our harvest share for this fishery. Based on these catch rates, we are predicting that we’ll hit our harvest share this weekend, so this section of the fishery, from the hwy 93 bridge south of Challis upstream to Sawtooth hatchery, will close Saturday night 7/7/18 at the end of fishing hours (10:00pm). The section of the Salmon River from Ellis (mouth of the Pahsimeroi) downstream approximately 6.5 miles to the Colston Corner boat ramp will open to Chinook angling on Saturday 7/7/18 at 5:30 am. We are predicting a harvest share of approximately 300 fish for this fishery. 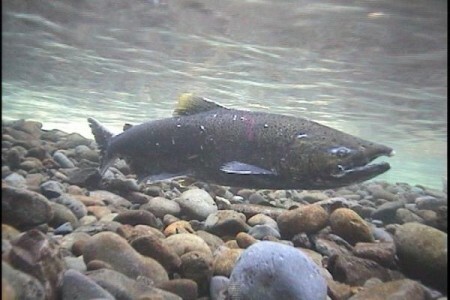 To date, Sawtooth hatchery has trapped 274 hatchery Chinook salmon, and Pahsimeroi hatchery has trapped 240 hatchery Chinook. River conditions remain good throughout the upper Salmon River, but the weather is supposed to get hot by the end of the week and remain hot through the weekend. Wishing everyone a safe and happy 4th of July, and good luck on the water!